In 1776, Friar Francisco Garces was the first Euro-American to use the trail. He was guided across the desert by Mohave Indians. Beginning in 1826, "Mountain Men" like Jedediah Strong Smith, Kit Carson, and Peter Ogden used the trail as they ventured across the southwest scouting new routes to the Pacific Coast. 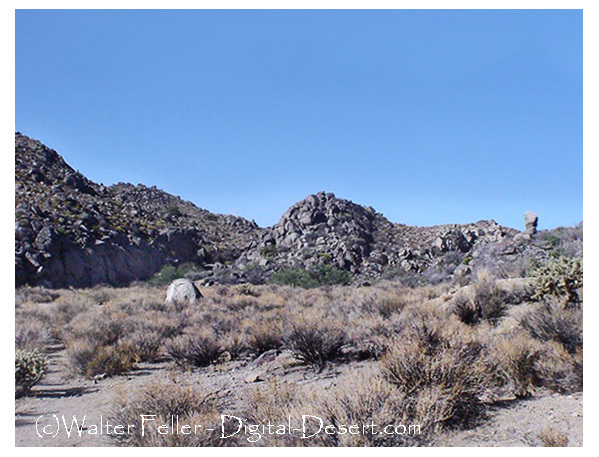 In 1854 Army Engineer Lt. Amiel Whipple led an exploration party along the Mojave Trail looking for a possible train route across the desert. In a rocky canyon he found and named Rock Spring. Camp Rock Spring had one of the highest desertion rates of any Army Camp. The camp was bleak and desolate and a harsh experience for any man assigned there. Their job was to provide protection for the mail crossing the desert. Although dangerous, there was no "glory of battle" and morale dropped. The soldiers watched, waited, guarded and tried to make life in the miserable camp bearable. The remote location made it difficult to bring in food and supplies. What little they had was strictly rationed. The lack of fresh food caused scurvy and other diseases. Water was scarce and of poor quality. Several unsuccessful attempts at improving conditions in the camp were made. Eventually the mail route was moved and the camp was no longer needed. Rock Spring was downgraded to an outpost and the soldiers who had not already deserted were reassigned. "No glory there, nor much for military fame; but true patriots and heroes were they, to submit to such privations. Too many of our frontier posts are akin to this, and little do members of Congress east, who know only the pomp and circumstance of glorious war,' imagine what army-life out there really is."